Along with our Bed Bug Heat Treatment, we also offer a chemical solution. 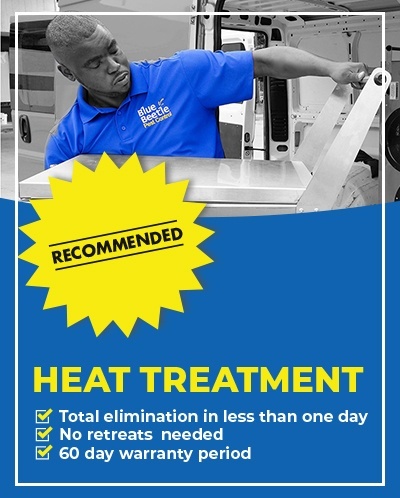 Our chemical treatments require much less preparation than a heat treatment, but the treatment process is much longer. Retreats are required every two weeks and depending on the level of infestation, can take up to two months for total elimination. 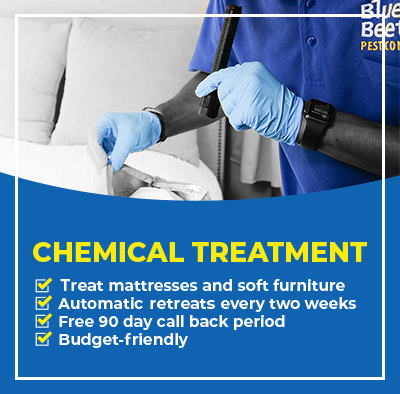 However, with patience and excellent preparation, chemical bed bug treatments are a budget-friendly solution that do work. Bed bugs hide within a 15 foot radius of where you sleep or sit the most. We’ll apply In the middle of the night is when they leave their hiding places for a blood meal. As they travel to you, they’re picking up the chemical on their feet. When they return to their hiding place, they lick themselves clean and ingest the chemical. Bed bugs only have to feed every seven days, and we have to wait for the eggs before the chemical will affect them as well. This is why a chemical treatment can be such a long process. How well you prepare for your chemical bed bug treatment will determine how long it takes for total elimination. • Remove all linens from beds and set mattresses and box springs on their sides. • Launder bedding and clothing, especially those that are on the floor, on the highest heat setting. Clean clothes hanging up or in drawers do not need to be washed or moved. • After washing clothing and bedding, seal them in trash bags and leave them in the kitchen or bathroom. • Remove all clutter from the floors. • Clear closet floors and shelving. • Pull furniture about 6 inches away from baseboards. • Remove light switch and outlet covers.